These past couple of days, I've been putting together a new quilt with a palette that is a little unusual for me. It's not often that I work with brown, but in the LuLu Lane collection, it really is lovely. The lattice pattern with these fabrics is simple, but it creates such a pretty wash of color. 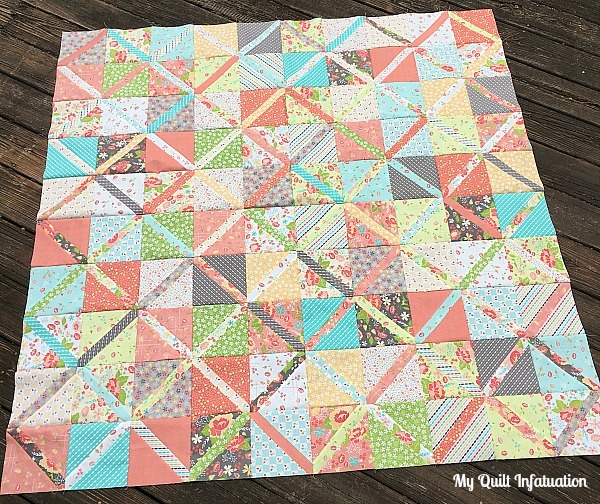 Last time I made a quilt with this pattern, several asked me how to make this quick block. It's super simple! Just cut starting squares at 6.5 inches, then slice them along the diagonal. Cut the center strips at 1.5" x 10.5" and sew between the two halves. Give the block a press, and trim to 6.5" inches. Easy peasy and oh, so pretty! **Edited, since a few have asked- I was able to just "eyeball" to line up the two triangle halves. There is a little bit of wiggle room there. Then, when I trimmed the block to size, I used the bias line on my square ruler to make sure the strip was centered within the block. I'm looking forward to getting this one all quilted and finished! Beautiful. It's always good to explore new palettes isn't it? Very pretty pattern and fabrics. I actually love the color brown. Great quilt and great technique. Is there a trick to making sure the second triangle is pieced correctly to the centre strip? Good question. I didn't even think about that. I think that a little mark in the center of the diagonal (spanning both sides of the cut triangles) before you cut it. Then fold the strip section in half and finger press. Match the fold of the strip to the markings. Since you're starting with a 6.5" square, and then trimming to 6.5" there is a little bit of wiggle room. I just eyeballed it to line up the two triangle halves, and then used the bias line on my square ruler to make sure the strip was centered while trimming. That is sooo cute! I love the fabric. Beautiful! Is this collection from Corey Yoder? She was at my guild meeting a few months ago and she talked about how LuLu Lane is named after her grandmother, who was SO excited about this. I don't like browns either, but it definitely works here! Very nice quilt. Thanks for sharing. I think a ruler with a diagonal line would help keep the blocks even and square.